If you're short on time in the morning, a bagel serves as a convenient breakfast food. If you're intent on following a low-carbohydrate diet, however, this baked treat isn't necessarily ideal. Regardless of their specific nature, bagels contain plenty of carbs. 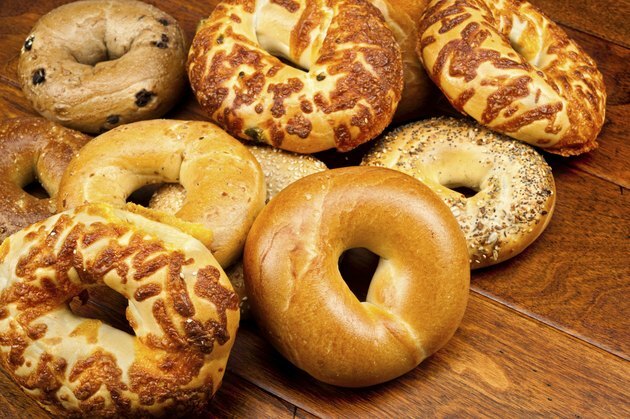 Many standard varieties of plain bagel have dozens of carbs. A 3.5-ounce wheat bagel contains 48 grams of carbohydrates. A 3.7-ounce oat bran or egg bagel each has 56 grams of carbs. Expect a flavored bagel to contain roughly the same number of carbohydrates. A 3.7-ounce cinnamon-raisin bagel has 58 grams of carbs, which is only slightly higher than a plain bagel. A 3.7-ounce bagel topped with poppy seeds, sesame seeds or onion flakes contains 53 grams of carbs. Grabbing a breakfast sandwich on a bagel at a fast-food restaurant gives you significantly more calories than consuming a plain or flavored bagel, but you won't experience a major increase in carbs. A bagel loaded with ham, egg and cheese contains 52.4 grams of carbs, while a bagel with egg, cheese and a sausage patty has 49.6 grams of carbs. With a piece of steak in lieu of ham or sausage, the breakfast sandwich has 58.4 grams of carbs. Spreading a standard topping on your bagel increases its carb count to varying degrees. Two tablespoons of low-fat cream cheese adds just 2.4 more grams of carbs to the bagel, but 2 tablespoons of reduced-fat peanut butter increases the meal's carb count by 12.8 grams. Two tablespoons of jam or preserves adds an extra 27.5 grams of carbohydrates to the bagel.